Discover the innovative world of Berkeley Machinery and our unique range or machinery covering all of your label and packaging needs. Over the last ten years, we have developed and established our own unique range of label and packaging solutions. Designed with the customer in mind, we have expanded our product line to one of the largest on the market today. All of our machines undergo vigorous quality and safety checks above and beyond today’s industry requirements. Contact us today and learn how our innovative concepts and flexible design options allow us to manufacture printing solutions for your needs. Berkeley Machinery are proud to offer you the following machines at amazing prices! The most common printing press for the label and packaging industry. Flexographic presses can print on any substrate and with Berkeley Machinery's intellectual designs you can produce a wide range of label and packaging products inline. 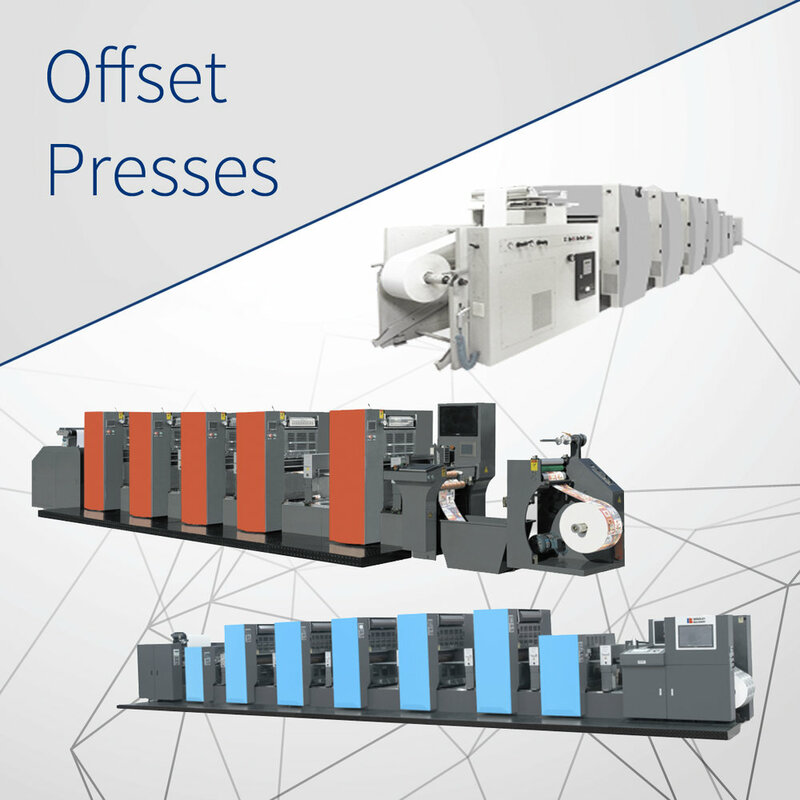 Offset Presses have been used for commercial printing for many years now and are used for specialised products associated with the wine and beverage industry. Berkeley Machinery's gravure presses allows the user to print gravure on a wide range of film and other special substrates. Berkeley Machinery core cutters offer a perfect solution for both large and small label and packaging convertors. Our core cutters can also be customised for other industrial requirements. Video plate mounters allow the user to mount plates on both cylinders and sleeves for both narrow and wide web flexo presses. Slitter rewinders are used to convert large reels into smaller reels which improves productivity and reduces material costs. This is useful for pre-printed reels or stock material which is sourced on wider reels. These specialised machines are used for die cutting labels and industrial products and can include hot stamping and embossing features as well. Laminators & coaters are used to produce laminated packaging products and innovative printing solutions. The Exagon Print tower allows the user to print both offset and flexo in the same print unit. Our unique range of sleeving machines can convert shrink film into printed sleeves at the highest quality. Inspection & detection machines can be used for ensuring high quality label and packaging products needed to meet stringent requirements. Central impression machines are suitable to print both unsupported and supported film with very fast make ready features at high productivity. Berkeley Machinery only sells the highest quality in used machinery with all of our machines going through a stringent approval process. Rotary flat screen presses allow the manufacturer to produce screen printed labels or tactile images. Working closely with the customer Berkeley Machinery can produce specialised machinery used to manufacture unique and patented products. Berkeley Machinery offers a variety of accessories which can be added to improve both the quality and productivity of your existing presses.